When making our travel plans this year, it came down to two places-Tanzania, Africa or to climb Macchu Picchu in Peru and while down there, hit up the Galapagos Islands. After much consideration, South America won, mostly due to our age and the physicality involved in the climb and because I want to do Italy next, so Scott got his wish. Our trip was 13 days long, and beyond incredible-we have over 700 photos, though I'll only include highlights. These forthcoming posts are truly for us to remember the nuances of the adventure because I wrote most of them while finding time and Internet abroad. If there are punctuation mistakes, it was due to a foreign keyboard where I gave up locating certain keys after a while. I do hope those reading enjoy our account as much as one can secondhand. After traveling 18 hours from Los Angeles to Miami to Lima, we finally landed in Cusco, Peru, to meet our local guide for a Half day tour as bonafide touristas. Peruvians do not heed Bob Barkers warnings of controlling the pet population. That was a rough to see. Dogs were everywhere. Peruvians, not surprisingly, also do not have much of a code enforcement division in their local municipalities. Driving is nutso as expected in a foreign country and takes defensive driving to a new level. 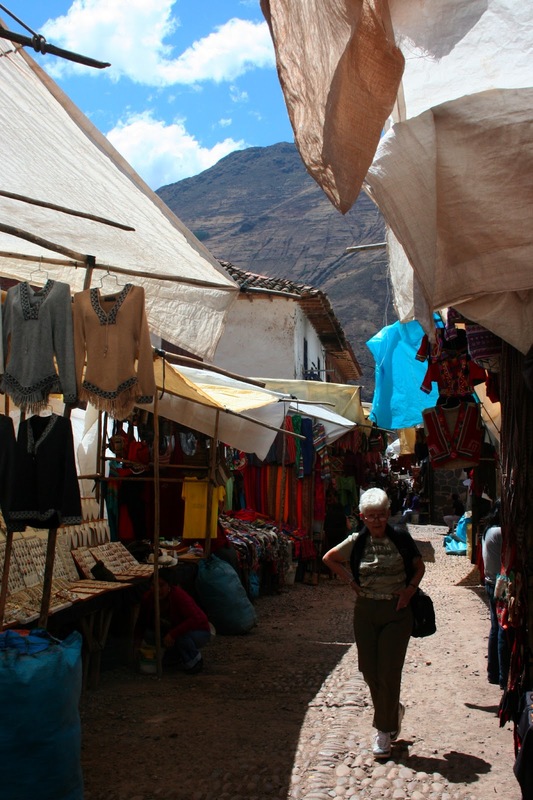 Much of Cusco and the Sacred Valley is quite poor. Houses are all made of mud, bricks, and stone and built perilously into the side of mountains. 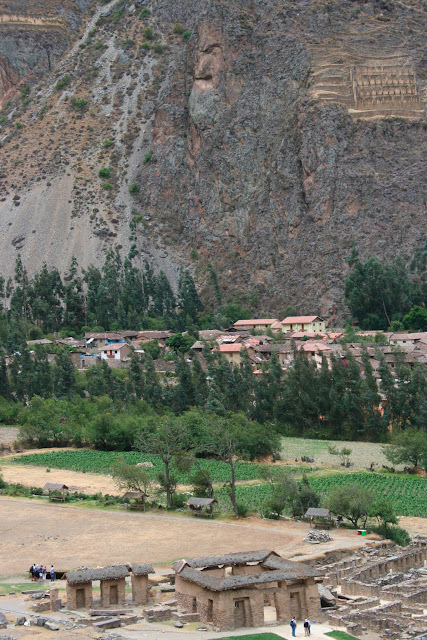 They speak Spanish and Quechua, the native language of the Incas. Streets are narrow and steep, often making traffic crazy. The first days tour included stops at what could only be called an alpaca/ Llama petting zoo, but it's true name, Awanakancha. Peruvians of this region hold the animals in high regard and in true Indian fashion, historically utilized all of their parts for survival. 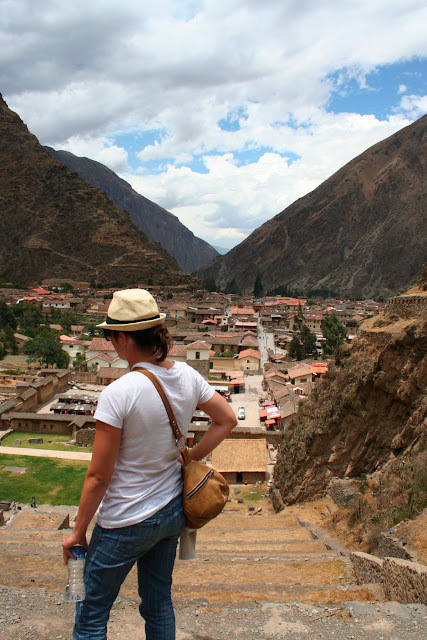 Tourists generally stop in Cusco en route to Machu Picchu to get acclimated to the high elevation. Another stop included the Inca ruins known as Ollantaytambo. Here our guide shared the history of the Inca civilization, Spanish conquests, and general information about Perus history. I was huffing and puffing, thinking I was in moderately good health, working out 5-7 days a week. Upon hoofing it up 300 two-foot stairs, my fear really sank in about the four day trek ahead. 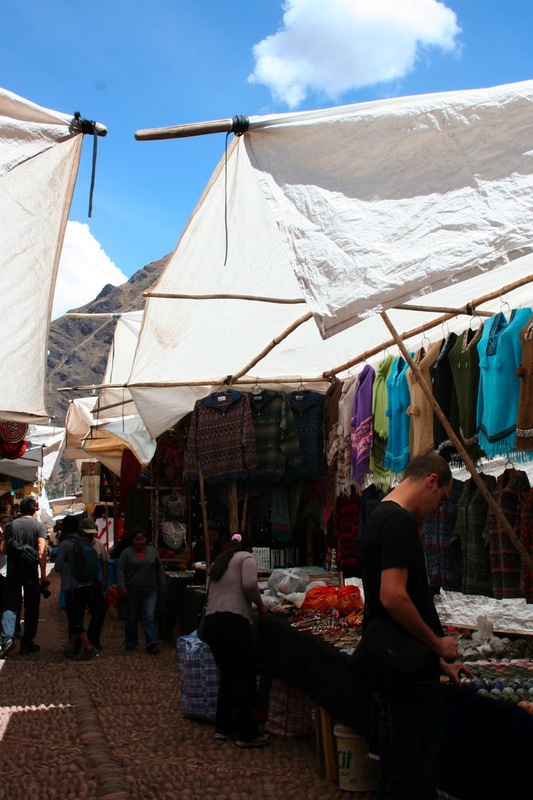 reasons: the crafts market, established between colonial buildings, and for hosting one of the complexes of terraces most impressive of the valley. The market consists of dozens of posts displayed and the sale of products worked by the inhabitants of the area. Passing routes included roadside bbq-guinea pig, a local favorite. Though I'll admit the most unusual of fare we enjoyed was alpaca-tasty. That afternoon, were also informed our pick up time for our four day camping hike to Machu Picchu was 230 am. Our itinerary had read a respectable 6 am but due to local factors, moved that up to the ungodly hour. After more sightseeing we finally made it to our hotel in the Sacred Valley, about two hours from Cusco, at 330 pm. The hotel was amazing-it had its own peacocks, a cinema, culinary kitchen, library, and spa. I wish we could have spent more time there. We showered, and assembled our packs and went to bed at 530, missing dinner* just to rest before the early call and subsequent trip, and from traveling fatigue. *As I write this on day 6, Scott lost 11 pounds, not sure about myself. Perhaps due to the altitude, we've not not had an appetite as well as the physical demands of the hike burning through calories. It was 25 hours between my last meal (lunch) in Los Angeles on Sunday, before my next meal on Monday, a late lunch, and no major hunger pains. This is coming from a girl who forces herself to wait until 1130 most days to dive into lunch.